The Sacramento County Office of Education Early Learning program has released a few cognitive development tips for children to increase their abilities in school. 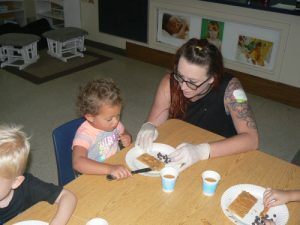 Something Extra Preschool works closely with the SCOE Early Learning program, following standards and using curriculum initiatives throughout our child care programs. Teaching children healthy food choices can get them started on the path to better mental development. This program offers healthy recipes, hands-on activities and more to help understand how healthy food impacts the body. Our staff at Something Extra offers healthy meals, and promotes the children in learning what is in their food and how it benefits their bodies. Something Extra Preschool continues to work in the many elements of the SCOE Early Learning program. From maximizing the time spent during hands-on activities in the classroom, to helping teachers plan for lessons with objectives and ideas. You can find out more about the SCOE Early Learning Program and you can get a few more cognitive development tips.